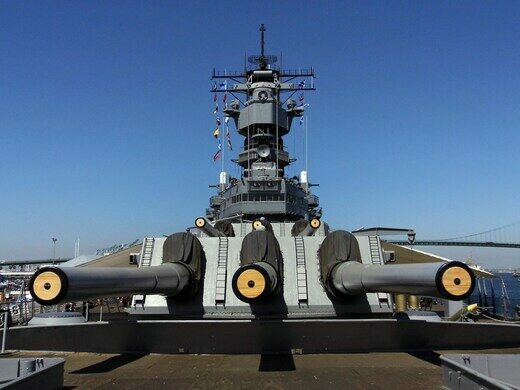 Spend the night on the USS Iowa, The Last of the Battleships. Friday, November 11, 2016 at 04:00p.m.–Saturday, November 12, 2016 at 10:00a.m. 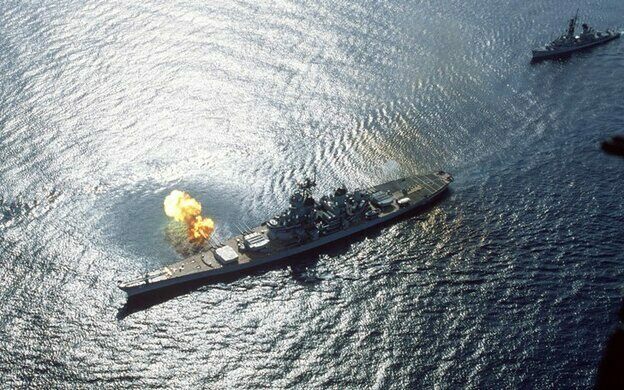 The USS Iowa may have been the first of the Iowa-class battleships to be commissioned, but she was the last battleship to retire permanently. 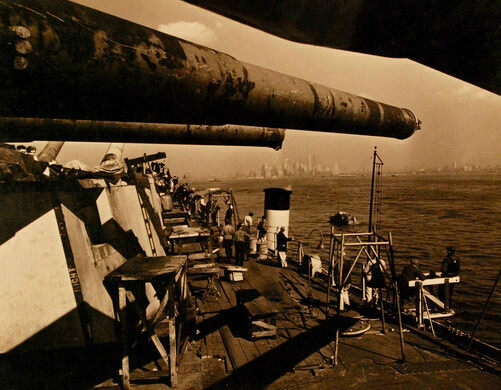 Once called the "Battleship of Presidents" (having hosted FDR, Reagan, and George H.W. 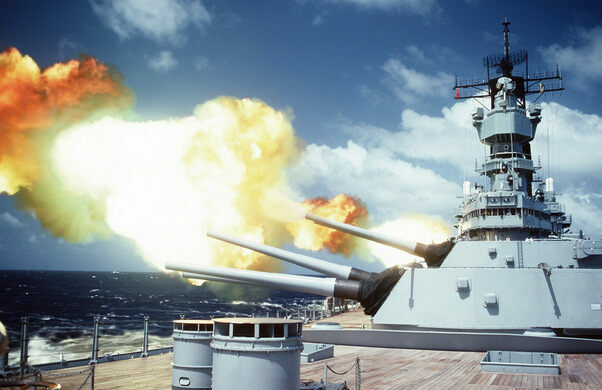 Bush), the USS Iowa had the biggest guns on any U.S. Navy ship, used primarily for anti-aircraft missions: nine 16-inch guns mounted on three stacked turrets on the flight deck (capable of carrying 2000 tons of firepower). 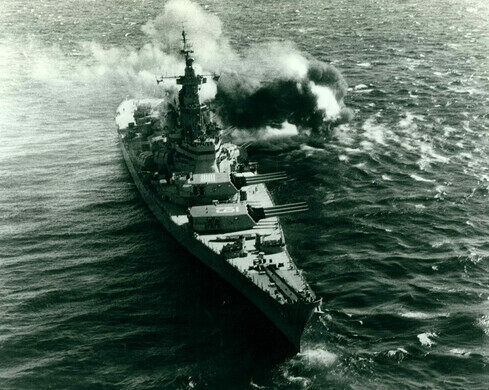 She was the lead ship of the last class of battleships in the Navy, having served in three significant commissions: World War II, the Korean War, and the Cold War. And now, having emerged from the Navy's mothball fleet just four years ago, she has made the Port of LA in San Pedro her permanent home. 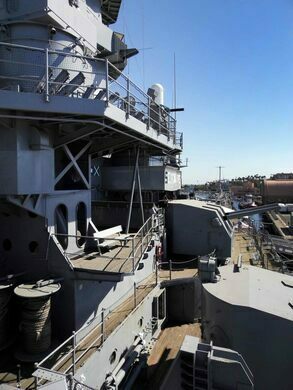 Join Field Agent Sandi Hemmerlein for a rare and immersive experience aboard the USS Iowa, now known as the Battleship Iowa Museum. In a "sleepover" excursion arranged exclusively for the Los Angeles Obscura Society—and the ONLY civilian adult group EVER to receive permission to do so—we will gather on the permanently moored ship in the late afternoon on Veteran's Day, November 11, to receive our safety briefing, get settled into our bunks, and chow down on an early dinner in the mess hall. 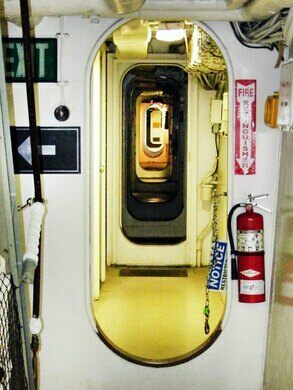 We'll then take an extensive tour of the massive warship—which measures 887 feet (about 0.15 nautical miles) in length—through staterooms, command centers, the main galley, and other areas that show what "life at sea" was like for sailors in the Pacific Fleet from the 1940s through the 1980s. And as a special bonus, we'll even gain exclusive access to some areas of this great, gray lady that are not currently open to the public during regular tours. 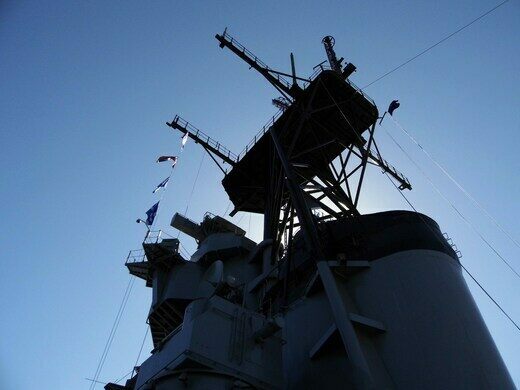 After a good night's sleep, we'll wake up to breakfast being served and a special Q&A session with actual veterans—some of whom served in the U.S. Navy and on this very same battleship. Don't miss this is a once-in-a-lifetime opportunity to really experience authentic routines and customs aboard the notorious "Big Stick" of the U.S. Navy, which has retired at the former home of the United States battle fleet from (1919-1940) and, more recently, the Long Beach Naval Shipyard. Dinner, tour, overnight accommodations, and breakfast all included in ticket price. Overnight parking available for an additional fee. The USS Iowa no longer sets sail, so don't worry about getting seasick! No children under age 16. Minors must be accompanied by an adult. No "in-and-out" privileges after lights out. This takes place in San Pedro at the Port of LA / LA Harbor. Please allow plenty of time for travel. Mattresses are single occupancy only. If you're very tall (over 6'4"), have broad shoulders, or are claustrophobic, these accommodations are not for you! Not handicap-accessible. Be prepared to walk up and down several flights of narrow, steep stairs and step up and over doorways. Beware of low overheads ("head knockers") and high watertight doorways ("knee knockers"). Vegetarian options available. Please check with us about ANY food allergies BEFORE you purchase your ticket. Inclement weather or national security issues may cancel the event. A portion of the proceeds will go towards the restoration and upkeep of the USS Iowa. Wear comfortable clothing and shoes for lots of walking indoors and outdoors. Bring a jacket for the evening chill, PJs, and a change of clothes for the next day. Absolutely no alcoholic beverages permitted. Bring bottled water! Smoking permitted only on the pier, before "Lights Out." Bring a flashlight and a camera. Photography encouraged! No weapons, fishing equipment, or chewing gum allowed on board.